This is a "best available" listing of US forces deployed to the Central Command Area of Responsibility (AOR) for Southwest Asia and for US forces deployed to European Command's locations in Turkey, Romania and Bulgaria. It does not include forces deployed exclusively for operations in Central Asia though it may at times list units that are involved in both Operations Iraqi and Enduring Freedom. This listing also does not account for US or Coalition forces involved in operations in the Horn of Africa. The task of developing a comprehensive listing of US forces present in the area is particularly difficult as the number of units rotating in and out of Southwest Asia are substantial. The events of Sept. 11, 2001 and the Global War on Terrorism has made such an effort significantly more difficult as the military seeks to improve operational security (OPSEC) and to deceive potential enemies and the media as to the extent of American operations. 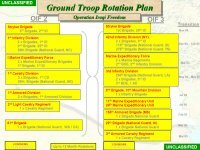 The significant number of troops that have been mobilized or activated in the United States for unspecified duties, whether they be in support of Operation Iraqi Freedom or in support of homeland security also complicates matters as it is not entirely clear which units are going where. This is further compounded by increasing reliance on the part of the Department of Defense on the mobilization of small-sized units to fill its manpower needs. These can range from individual companies, batteries, to even smaller-sized groups of troops rather the mobilization of entire battalion-sized units. This being the case, mistakes, misidentifications, or ignorance regarding specific units being in the region, or not being in the region will occur. Initial war plans for Iraq had an initial American invasion force of about 130,000 soldiers and Marines, which would drop quickly to as few as 30,000 to 50,000 by the end of 2003. As of October 2005 80,000 of the Guard and Reserve forces were deployed in 40 nations. The largest portion was in Iraq, where Guard units accounted for eight of 15 Army combat brigades. As of 01 March 2006 there were 133,000 US troops in Iraq, down from about 160,000 in December 2005 during parliamentary elections. The Pentagon cut Army combat brigades to 15 from 17. The 25th Infantry Division from Hawaii, along with seven other major military units are scheduled to deploy as part of the Summer 2006 troop rotation. The Pentagon hoped to reduce the US presence in Iraq to less than 100,000 by the end of 2006. By March 2006 some 7,000 Schofield Barracks soldiers were preparing for deployment in August 2006. The soldiers deployed in April 2006 to the National Training Center at Fort Irwin, California. The 25th Infantry Division would command Multinational Division North-Central operations in northern Iraq, with four to five brigades, one of which will be the 3rd Brigade Combat Team from Hawaii. At that time, more than 1,000 Marines of the 3rd Battalion, 3rd Marine Regiment, and Marine Heavy Helicopter Squadron 463 were already on their way to Iraq. On 15 March 2006 it was reported that a battalion of about 700 soldiers from the 2nd Brigade, 1st Armored Division would deploy into Iraq from their base in Kuwait to provide extra security during the holiday of Ashura, which ended 20 March 20006. The unit is one of the three battalions that were originally were scheduled to deploy to Iraq but were held in Kuwait as a standby force. Nearly 4,100 soldiers in the 34th Brigade Combat Team left for Iraq in late March 2006. The soldiers were from Iowa, Kansas, Kentucky, Nebraska and New Jersey. The deployment included 2,600 from Minnesota's National Guard, the largest contingent from the state to see combat since World War II. By June 2006 the US had 14 combat brigades in Iraq, and a total of 127,000 troops. According to a 25 June 2006 report in the New York Times, a draft plan calls for significant reductions in the American military presence in Iraq by the end of 2007. 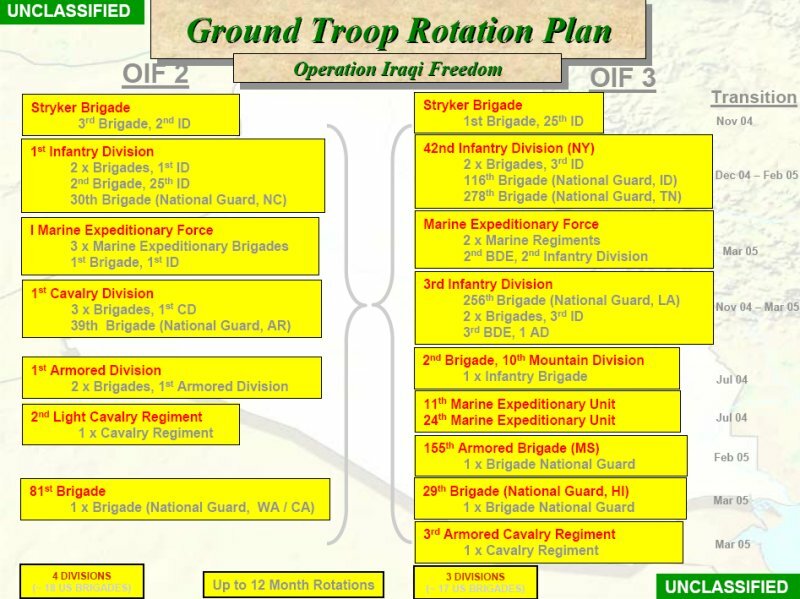 The initial drawdown would involve the First Brigade of the 10th Mountain Division and the Third Brigade of the 101st Airborne Division are scheduled to rotate out of Iraq in September 2006, and would not be replaced. By December 2006, the number of US combat brigades in Iraq could be as low as 10 to 12, seven to eight brigades by June 2007 and five or six brigades by December 2007. Combat brigades, which typically number about 3,500 troops, account for only a portion of 127,000 American troops in Iraq, and other support units would not draw down as quickly. There were about 152,000 US troops in Iraq as of early October 2005. As of mid-November 2006, there were approximately 152,000 US troops deployed to Iraq. 1st Brigade, 25th Infantry Division, Fort Wainwright, Alaska. 2nd Brigade, 4th Infantry Division, Fort Carson, Colo.
2nd Brigade, 1st Infantry Division, Fort Riley, Kan.
3rd Brigade, 82nd Airborne Division, Fort Bragg, N.C.
On October 19, 2007, DoD announced that the 4th Brigade, 4th Infantry Division would deploy in the summer of 2008 to support Operation Iraqi Freedom. Prior to its deployment, the brigade will be re-designated as 4th Brigade, 1st Cavalry Division; while the existing 4th Brigade, 1st Cavalry Division, already deployed in Iraq, would re-deploy and be re-designated to become part of 1st Armored Division after its return to home station. 39th Infantry BCT, Little Rock, Ark. 76th Infantry BCT, Indianapolis, Ind. 37th Infantry BCT, Columbus, Ohio. Additionally, the 25th Infantry Division headquarters would have its tour extended by ~45 days. The 2nd BDE, 82nd Airborne Division, and assigned as the call forward force in Kuwait, will move into Iraq and assume a security mission there. The 1st BDE, 34th Infantry Division, Minnesota ARNG, will be extended in its mission for up to 125 days and will redeploy not later than August 2007. The 4th BDE, 1st Infantry Division, will deploy in February 2007 as previously announced. The 3rd BDE, 3rd Infantry Division, will deploy in March 2007. The 4th Stryker BDE, 2nd Infantry Division, will deploy in April 2007. The 2nd BDE, 3rd Infantry Division, will deploy in May 2007. The Marine Corps will extend two reinforced infantry battalions for approximately 60 days. The 15th Marine Expeditionary Unit (Special Operations Capable) will remain in Iraq for approximately 45 additional days. Finally, the USS Stennis Carrier Strike Group and the 3rd Battalion, 43rd Air Defense Regiment will deploy to the region to bolster security. 3rd Infantry Division Headquarters, Fort Stewart, Ga.
4th Brigade, 1st Infantry Division, Fort Riley, Ks. 4th Brigade, 2nd Infantry Division, Fort Lewis, Wa. 3rd Brigade, 3rd Infantry Division, Fort Benning, Ga. In addition, the Department of Defense also alerted approximately 27,000 active duty and 10,000 reserve component troops in combat support and combat service support units smaller than brigade-size elements for deployment beginning in 2007. The deployment of the 172nd Stryker Brigade Combat Team operating in Iraq was to be extended for up to 120 additional days. In August, 2006, the 172nd SBCT was moved into the Baghdad area. II Marine Expeditionary Force, Camp Lejeune, N.C.
2nd Brigade, 2nd Infantry Division, Fort Carson, Colo.
2nd Brigade, 10th Mountain Division, Fort Drum, N.Y. The 1st Brigade, 1st Infantry Division, based at Fort Riley, Kan., previously notified to prepare to deploy in early December, has been advised it will not deploy prior to Dec. 31, 2005. On September 25, 2006, the Department of Defense announced that it had delayed the redeployment of the 1st Brigade Combat Team, 1st Armored Division, based in Friedberg, Germany, for approximately 46 days. The unit was scheduled to redeploy in mid-January 2007, and would as a result begin that redeployment in late February 2007. This decision was taken to allow the 1st Brigade Combat Team, 3rd Infantry Division to complete its one year dwell time and then deploy in January 2007. Additionally, it was announced that the 4th Brigade Combat Team, 1st Cavalry Division would deploy 30 days earlier than originally scheduled and begin its deployment in late October 2006. 1st Brigade, 10th Mountain Division, Ft. Drum, N.Y.
101st Airborne Division, Air Assault (division headquarters and 4 brigades), Ft. Campbell, Ky.
1st Brigade, 1st Infantry Division, Ft. Riley, Kan.
On August 3, 2006 Secretary of Defense Donald Rumsfeld testified that 133,000 US personnel were deployed in Iraq. At the same hearing, the number of troops in the Central Command AOR was officially estimated at 200,000 by General John Abizaid. As of August 22, 2006, over 17,000 coalition personnel from 23 nations were deployed in Iraq. Inside the Horn of Africa there were around 1,200 that dedicate or focus themselves on the Horn of Africa. In Afghanistan there were around 22,000. The US Air Force's Expeditionary Air and Space Force (EAF) concept and organization sets a guideline for Air Force deployments to operational locations. The EAF is comprised of 10 Aerospace Expeditionary Forces (AEF) each with lead combat and support wings including on-call wings that could be deployed if required. While deployments for active duty units generally lasts roughly 90-days, Reserve and Guard units deploy typically for 30-60 days. In testimony before the House Armed Services committee on June 13, 2006, General D.W. Corley, USAF reported that "[i]n Iraq, the Air Force [had] flown over 237,000 sorties." The Marine presence in Iraq is centered around the I Marine Expeditionary Force and the 1st Marine Division. One Marine Expeditionary Unit, the 15th MEU is deployed to Kuwait. One Marine Expeditionary Unit is also in the region, though it is currently supporting operations in Afghanistan [and are thus not included in this tally]. On June 30, 2005, General Michael W. Hagee, Commandant, USMC, testified that about 23,000 Marines were deployed in Iraq and would remain there into 2006. General Hagee also testified on the same day that 27,000 Marines were deployed in the Central Command AOR.